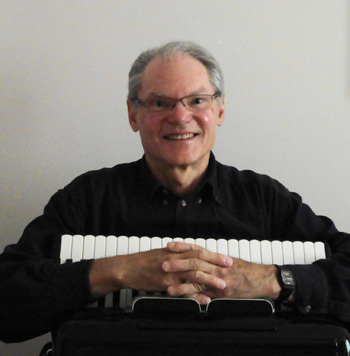 Peter Wilk, composer, arranger, accordionist, accordion transcriptions/arrangements. I currently live near Nanaimo on Vancouver Island in British Columbia. I studied accordion with: Eric Mundinger, Jerry Cingolani -- concert master of the Mundinger accordion orchestra, and music theory and harmony with Dr. Goodwin from the Conservatory of Music in Toronto. RPM magazine review of my CD Favourite Classics, "... dazzling dexterity... translucent tonality... dramatic dynamics. Accordion aficionados will lap it up; all music lovers will enjoy it. An excellent solo album." Repertoire: Popular standards, classics, world music including French, Italian, Polish, Ukrainian, Russian, Klezmer, theatre & film music. Venues: Solo & ensemble performances & recording sessions; cafe & restaurant music, Oktoberfest, theatre orchestra, singer & choir accompaniment, house parties, conventions, special events, etc. Awards: Most recently: First Prize, Open competition, 8th Victoria International Accordion Festival 2014, any musical style except classical. Hohner Cup winner. Arranger: Accordion transcriptions/arrangements of music that I particularly appreciate. Composer: Original compositions for accordion. wp501 - Salut d'Amour with mp3 sound file. wp502 - Ave Verum Corpus with mp3 sound file. wp503 - Nimrod with mp3 sound file. wp504 - Valse Romantique with mp3 sound file. wp505 - Happy Poppa Polka with mp3 sound file. wp506 - Days Gone By with mp3 sound file. wp507 - Clair de Lune with mp3 sound file and video.